Eagle Scout is the highest achievement or rank attainable in the Scouts BSA program of the Boy Scouts of America (BSA). Since its inception in 1911, only four percent of Scouts have earned this rank after a lengthy review process. The Eagle Scout rank has been earned by over 2.5 million youth. Requirements include earning at least 21 merit badges. The Eagle Scout must demonstrate Scout Spirit, an ideal attitude based upon the Scout Oath and Law, service, and leadership. This includes an extensive service project that the Scout plans, organizes, leads, and manages. Eagle Scouts are presented with a medal and a badge that visibly recognizes the accomplishments of the Scout. Additional recognition can be earned through Eagle Palms, awarded for completing additional tenure, leadership, and merit badge requirements. The Boy Scouts of America's highest award was originally conceived as the Wolf Scout, described in the June 1911 Official Handbook for Boys. The August 1911 version of the handbook changed this to Eagle Scout. The medal illustrated in the handbook was a profile of an eagle in flight, but was changed to the current design before any were issued. In their original conceptions, Life Scout, Star Scout (Life preceded Star until 1924) and Eagle Scout were not ranks, but part of the merit badge system that recognized Scouts who had earned a specified number of merit badges. Eagle Scout was awarded to any First Class Scout who had earned 21 merit badges. The first Eagle Scout medal was awarded in 1912 to Arthur Rose Eldred, a 17-year-old member of Troop 1 of Rockville Centre, Long Island, New York. Eldred was notified that he was to be awarded the rank of Eagle Scout in a letter from Chief Scout Executive James West, dated August 21, 1912. The design of the Eagle Scout medal had not been finalized by the National Council, so the medal was not awarded until Labor Day, September 2, 1912. Eldred was the first of three generations of Eagle Scouts; his son and grandson hold the rank as well. In the 1960s, the Kansas City area awarded more Eagle Scout badges than any other council in the country, resulting in the creation of the Eagle Scout Memorial there in 1968. In 1982, 13-year-old Alexander Holsinger of Normal, Illinois, was recognized as the one-millionth Eagle Scout, and Anthony Thomas of Lakeville, Minnesota, was the two-millionth in 2009. On October 11, 2017, the Boy Scouts announced that in 2019, a program for older girls will be available, enabling girls to earn the rank of Eagle Scout. 52,160 Eagle Scout awards were presented in 2018, 6.5 percent of the eligible 2018 membership. Over 2.5 million Eagle Scout awards have been presented in total since 1912. The rank of Eagle Scout may be earned by a Scout who has been a Life Scout for at least six months, has earned a minimum of 21 merit badges, has demonstrated Scout Spirit, and has demonstrated leadership within their troop, crew or ship. Additionally he must plan, develop, and lead a service project—the Eagle Project—that demonstrates both leadership and a commitment to duty. After all requirements are met, he must complete an Eagle Scout board of review. The board of review can be completed up to 3 months after their 18th birthday as long as all other requirements are completed before their 18th birthday. Venturers and Sea Scouts who attained First Class as a Scout may continue working toward the Star, Life and Eagle Scout ranks, as well as Eagle Palms, while registered as a Venturer or Sea Scout up to their 18th birthday. Scouts with a permanent mental or physical disability may use alternate requirements based on abilities, if approved by the council. With the introduction of Scouts BSA and the acceptance of girls, the age limit for Eagle Scout may be extended. New youth members, girls or boys, 16 years of age or older, but not yet 18 who join between February 1, 2019 and December 31, 2019 may request an extension to complete the Eagle Scout Award requirements after they turn 18 years of age. Eagle Scout may be awarded posthumously, if and only if all requirements except the board of review are completed before death. A board of review may be held and the award presented to the Scout's family. The Spirit of the Eagle Award is an honorary posthumous special recognition for any registered youth member who has died in an accident or through illness. The Line of Duty Fallen Eagle Recognition is a recognition for Eagle Scouts who have died in the line of duty in professions such as the military, law enforcement or emergency services. The Eagle Scout Service Project, or simply "Eagle Project," is the opportunity for a Scout to demonstrate leadership of others while performing a project for the benefit of any religious institution, any school, or his community. The project is not allowed to benefit the Boy Scouts of America or its councils, districts, units, camps and so forth. It also cannot be of a commercial nature or be solely a fund-raising project. Eagle Scout requirements have evolved since the award was conceived. A requirement to earn 11 specific merit badges was added in 1914, which underwent minor changes in 1915. The Life–Star order was reversed in 1924, apparently because the five-pointed star of the Star Scout insignia could be associated with the five merit badges required to earn the rank immediately following First Class Scout. In 1927, Eagle Scout began the transition from being a super merit badge to a rank. As a result, the first requirements for tenure were created and Scouts were required to be an active First Class Scout for one year. The initial requirements for what became the service project appeared with a requirement to show satisfactory service and the number of required merit badges increased to 12. In 1936, the ranks of Star and Life became mandatory, and the number of required merit badges rose to 13. It was at this time that Eagle Scout became a full-fledged rank. In 1952, age limits were set so that adults over 18 years of age could no longer earn Eagle Scout and the service project requirement was slightly expanded to "do your best to help in your home, school, church or synagogue, and community." In 1958, the number of required merit badges increased again to 16 of the 21 total merit badges needed to obtain Eagle, along with the first requirements for service and leadership. In 1965, the requirements for the service project and specific troop leadership were defined, and the number of required merit badges returned to 11. The Eagle Scout candidate was required to plan, develop, and carry out a leadership service project. Minor changes were made to the required merit badge list in 1970. In 1972, the Improved Scouting Program increased to 24 the number of merit badges needed to obtain Eagle, while reducing the list of required merit badges to ten, eliminating badges that required swimming and outdoor skills—both of which were later reinstated, and adding the requirement to show leadership during the service project. In 1978, the number of merit badges needed for Eagle was lowered to the original 21, and the number of required merit badges was set at 11 (this was changed to 12 in 1993). In 2014 the number of Eagle required merit badges were increased to 13. Palms represent additional advancement for a young man who has stayed active in his unit after achieving the rank of Eagle Scout. A Palm is awarded when the Scout has demonstrated Scout Spirit, leadership and ability; has earned five additional merit badges beyond those required for Eagle or for the last Palm; and has taken part in a conference with his unit leader. Merit badges which the young man has earned before reaching Eagle Scout are acceptable to use towards earning Palms. The insignia is a small metallic palm frond pin or device that is worn on the ribbon of the Eagle Scout medal, on the Eagle Scout square knot or on the Eagle Scout badge. The Palms are awarded in three colors: bronze, representing five merit badges; gold, representing ten merit badges; and silver, representing fifteen merit badges. For each Palm awarded for five additional merit badges beyond the first bronze, gold, and silver recognitions, Palms are worn in combinations which require the smallest number of devices to reflect the total number of Palms earned. For instance, a Scout who has earned eight Palms would wear two silver Palms and a gold Palm. The order of bronze, gold and silver follows heraldic traditions borrowed from the U.S. military. A new Eagle Scout can instantly receive, alongside his Eagle medal, all Eagle Palms earned for merit badges completed before becoming an Eagle Scout. These Palms recognize additional merit badges earned before completing the Eagle board of review. Previously, an Eagle Scout needed to wait three months between each Palm—even if the extra merit badges were earned before becoming an Eagle. This meant that, under the old rules, a youth who became an Eagle Scout at 17 years and 10 months, was mathematically unable to earn any Eagle Palms. The Eagle Scout badge is worn on the left shirt pocket by youth. Adult leaders who earned the rank of Eagle Scout as a youth may wear the square knot on their uniform above the left shirt pocket. The Eagle Scout medal is worn on the left shirt pocket flap of the uniform. It is usually only worn on ceremonial occasions, and can be worn by both youth and adults while wearing the badge or square knot. 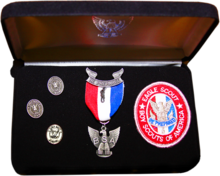 The Eagle Scout Award Kit currently includes the Eagle Scout medal, the Eagle Scout badge, a mother's pin, a father's pin and an Eagle Mentor pin. A variety of caps, belt buckles, pins, tie tacs, neckerchiefs and slides, bolo ties, rings, jackets, T-shirts and other items are also available for purchase. Official Eagle Scout insignia is controlled by BSA Supply and requires verification by presentation of an Eagle Scout card or other means before it can be purchased. Since its introduction in 1912, the Eagle Scout medal has undergone several design changes. Changes to the scroll and to the eagle pendant were not always introduced at the same time, therefore types may be somewhat mixed. Scouting historians classify these medals by the five different manufacturers and then by 17 sub-types, with several minor variations. Many variations were caused by quality control issues, mainly due to wear of the dies. During the 1920s and 1930s, some military schools allowed wearing of the Eagle Scout medal on the uniform. In order to conform to the medal system, the scroll was removed and the ribbon affixed to a standard ribbon bar. T. H. Foley made the first medals from 1912 until they went out of business in 1915. The eagle pendant and scroll were of die struck bronze washed with silver. Early versions were made with a short double knot and later ones with a long double knot. Only 338 of these medals were issued, making them the rarest version. Some Foleys were issued with a drop ribbon: the ribbon was extended, folded through the bar mount on the scroll, then dropped behind the eagle pendant and cut in a swallowtail. The first drop ribbon style medal was issued to the fourth Eagle Scout, Sidney Clapp, a 31-year-old Scoutmaster from West Shokan, New York. In 1920, the Robbins Company took over production. They produced six distinct variants, all in sterling silver. The first 1920 version was similar to the Dieges & Clust design, but with smaller scroll lettering and the standard single knot. The second 1920 version has more distinctive feathering on the back side of the pendant. The engraving on the 1930 version is especially fine. In 1933, BSA was removed from all of the Eagle Scout insignia, including the medal. In 1955 the obverse of the eagle pendant was made flat so it could be engraved. BSA was added back to the front and the reverse was returned to a full feathered design in 1969. Medal manufacturer Stange was authorized to begin producing Eagle Scout medals in 1968, at the same time as Robbins – they created six distinct models. The 1968 version is very similar to the Robbins version, but the bend in the scroll is much flatter, more like a sideways V as compared to the S on the Robbins scroll. The BSA was added back to the front, and the obverse was returned to a full feathered design in 1970. A major re-design of the eagle pendant was made in 1974 to match the new NESA logo. In 1978, Robbins ceased manufacturing Eagle Scout medals and Stange switched to the last design used by Robbins. Minor differences are in the white edged ribbon and the sterling silver markings. In 1980 the price of silver rose dramatically and the medal was changed to silver-plated, die-struck copper. Very early versions were silver-plated and oxidized, thus the scroll and pendant are black. Later versions were oxidized, buffed and lacquered to maintain the silver shine. Sterling silver medals were produced from the same dies and from this time were only available on special order. The year 1993 saw a number of changes. The clasp on the scroll was changed from the pin on type to a double clutch back. The pendant was changed to pewter and enlarged due to the lighter rigidity of the material. Custom Fine Jewelry (CFJ) took over the contract in 1999 and has currently created three types. The initial versions were based on the last Stange version but with the ribbon attached through the clutch pins instead of a bar (this led to damage of the ribbon). A small number of sterling silver versions were made, marked with 925. In later 1999, the dies were laser engraved, giving a much sharper look and the ribbon mount was improved to eliminate wear. The knot went from wire to a molded version in 2001. In the fall of 2006, the national supply division of the National Eagle Scout Association (NESA) began to issue replica Eagle Scout medals for specific wear on U.S. military dress uniforms. These medals were designed to be proportionate to other military medals: they contained the same pendant, but no scroll, and a ribbon that had been made thinner and more rectangular in shape. However, in December 2007, NESA stopped selling the mini-medal after service uniforming committees all contacted the BSA and asked them to stop promoting the medal for wear on military dress uniforms. The Eagle Scout medal is not authorized for wear on any U.S. military uniform. Since its introduction, the Eagle Scout badge has undergone several design changes. Scouting historians have classified these badges into nine different designs, with several minor variations within each type. The cloth badge was introduced for Eagle Scouts attending the 2nd World Scout Jamboree in Denmark in 1924 with a design based on the hat pin. The Eagle Scout merit badge was sewn onto the top of the merit badge sash that was also created for the jamboree. The design is quite similar to the current badge. As with other patches of the time, the rank badges were embroidered onto rolls of fabric and then cut. The edges were folded under before sewing the badge onto the sash. Initially produced on tan cloth, it was later switched to olive for the Boy Scout uniform and white and blue to match the various Sea Scout uniforms. In 1933, BSA was removed from all of the Eagle Scout insignia, including the badge. The text Eagle Scout and Boy Scouts of America was added to the border, and Be Prepared was added to the scroll. These badges were embroidered with silk thread, switching to cotton in 1940. The production of badges and emblems changed in 1956 to the rolled edge now in current use, thus eliminating the various colored backgrounds. The outside oval was then changed to red. With the introduction of the Improved Scouting Program in 1972 came an overhaul of many badges and emblems. The new stylized Eagle Scout badge with no text was a major change that proved to be unpopular. It appears that some Scouters commissioned reproductions of the 1956 badge for issue in place of the 1972 version. In 1975 the badge design partially reverted to the 1956 version. 1985 saw a reversion to the 1956 issue with some minor differences. The border and the eagle were done in silver metalized thread and the Be Prepared text was in blue. In 1986 the metalized eagle changed back to standard thread due to problems with wearing and the scroll and text were enlarged. The metalized border was changed to standard thread in 1989. Later variants increased the thread count of the white stripe to eliminate the visible background. For the 2010 centennial, all of the rank badges had 2010 added to the text. To recognize the Eagle Scout centennial in 2012, a new version was released with Eagle Scout and Centennial in silver and with 1912 and 2012 in gold. Eagle Scout hat pins were produced from 1921 through 1958 with several variations. Eagle Scouts who earned additional merit badges were recognized using Eagle Palms, introduced in 1927. Adults who had earned Eagle Scout began to be recognized in 1934 with a red, white and blue ribbon bar. In 1940, a small eagle pin was added to the bar. Ribbon bars were replaced by embroidered square knot patches in 1947. Over the years, the knot was produced with various background colors to match the different uniforms. Although the Venturing and Sea Scout programs use different uniform shirts, the current knot is available only with a tan background that matches the Scouts BSA uniform. When the Distinguished Eagle Scout Award (DESA) was created in 1969, a gold-colored eagle device was introduced for wear on the Eagle Scout square knot. The Eagle Scout Mentor pin was introduced in early 2004 in a gold-colored version. In early 2006 it was changed to a silver-colored antique finish to match the mother and father pins but in 2007 was changed back to gold-colored. In 2008, the National Eagle Scout Association (NESA) introduced a knot recognizing those Eagle Scouts who are life members of NESA; it uses the standard knot emblem with a silver border. From 1912 to 1943 the BSA issued an index-sized card with information about the Eagle Scout. Wallet-size cards were introduced in 1944 and switched to a plastic credit card style in 1991. Certificates suitable for framing were first issued in 1944. As the honorary president of the BSA, the signature of the President of the United States appears on all certificates. Replacement of a card or certificate can be made by application through the National Eagle Scout Association (NESA). Eagle Scouts are expected to set an example for other Scouts and to become the leaders in life that they have demonstrated themselves to be in Scouting. They are disproportionately represented in the military, service academy graduates, in higher education and academia, major professions, the clergy, business and politics. :149–159 Eagles are more likely to exercise for 30 minutes or more every day, volunteer for religious and nonreligious organizations, have closer relationships with family and friends, be in a leadership position at their place of employment or local community, donate money to charitable groups, and to work with others to improve their neighborhoods. The list of Eagle Scouts is extensive. In addition, the accomplishment is considered to be notable as Adult Scouters who earned Eagle Scout as a youth are entitled to wear a square knot emblem with a red, white, and blue striped square knot above the left shirt pocket. Eagle Scouts may join the National Eagle Scout Association (NESA), which serves as a fraternal and communications board for all Eagle Scouts. The NESA Outstanding Eagle Scout Award recognizes Eagle Scouts who have demonstrated outstanding achievement at the local, state, or regional level. 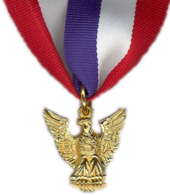 The Distinguished Eagle Scout Award is given only to Eagle Scouts for distinguished service in their profession and the community for a period of at least 25 years after earning Eagle Scout. Eagle Scouts who enlist in the U.S. Armed Forces may receive advanced enlisted rank in recognition of their achievements. For commissioned officer programs, attainment of Eagle Scout is considered a positive factor in determining service academy appointments and award of college ROTC scholarships. NESA directly administers several Eagle Scout scholarships. The American Legion, the National Jewish Committee on Scouting, and the Sons of the American Revolution offer scholarships directed toward Eagle Scouts. Many colleges and universities, local businesses, churches and other organizations offer similar scholarships. 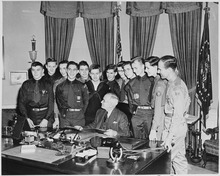 After the BSA v. Dale decision in 2000 affirmed the BSA's right to exclude homosexuals, a small number of Eagle Scouts returned their badges to the National Council in protest of the BSA's policies. The advocacy group Scouting for All claimed to have received as many as one thousand letters from Eagle Scouts who had done so; the BSA later stated that fewer than one hundred Eagle Scout badges had been received. In 2012, the BSA reaffirmed its policies on the exclusion of homosexuals; again a number of Eagle Scouts returned their badges in protest. In May 2013, the National Council of the Boy Scouts of America voted to lift the ban on openly gay youth beginning on January 1, 2014, with the ban on openly gay adult leaders remaining in effect. On June 27, 2015, the ban on gay leaders was also lifted. In response, two Eagle Scouts returned their badges in protest of the change to the BSA's policy accepting gay Scouts. Four Nobel Prize laureates are known to be Eagle Scouts: Dudley R. Herschbach, Peter Agre, Robert Coleman Richardson, and Frederick Reines. Eleven Eagle Scouts have been awarded the Medal of Honor: Eugene B. Fluckey, Aquilla J. Dyess, Robert Edward Femoyer, Walter Joseph Marm, Jr., Mitchell Paige,:18–19 Thomas R. Norris, Arlo L. Olson, Ben L. Salomon, Leo K. Thorsness, Jay Zeamer Jr. and Britt K. Slabinski. At least forty astronauts earned the rank as a youth, including Neil Armstrong and Charles Duke, both of whom walked on the moon. Businessmen who have earned the award include Wal-Mart founder Sam Walton,:88–89 Marriott International CEO J. W. Marriott, Jr., and Michael Bloomberg, Mayor of New York City and founder of Bloomberg L.P.
Michael Bloomberg, NYC Mayor and founder of Bloomberg L.P.
L. Ron Hubbard, founder of the Scientology religion, and pulp fiction writer. He was also the youngest Eagle Scout in American history at the time. Eagle Scouts who have held public office include 38th President of the United States Gerald R. Ford, 22nd U.S. Secretary of Defense Robert Gates,:217–218 13th and 21st U.S. Secretary of Defense Donald Rumsfeld, 69th U.S. Secretary of State Rex Tillerson, Associate Justice of the U.S. Supreme Court Stephen Breyer:56–59 and 84th U.S. Attorney General Jeff Sessions. In academia, Eagle Scouts are represented by Pulitzer Prize for General Nonfiction-winner E.O. Wilson, E. Gordon Gee, former President of Ohio State University, and Kim B. Clark, former Dean of the Harvard Business School, and former president of Brigham Young University–Idaho. Entertainers who earned the BSA's highest rank include documentary filmmaker and Academy Award-winner Michael Moore, Academy Award-winning director Steven Spielberg, Evan Roe, star of the CBS Television primetime hit drama Madam Secretary and Mike Rowe, host of the Discovery Channel's Dirty Jobs. Athletes who have earned Eagle Scout include Basketball Hall of Famer (later U.S. Senator) Bill Bradley, NBA All-Star Mark Eaton, MLB All-Star Shane Victorino and pitcher Jon Moscot, and Notre Dame and San Diego Chargers linebacker Manti Te'o. Religious leaders who have earned Eagle Scout include Cardinal Archbishop Emeritus of Baltimore William H. Keeler, and Howard W. Hunter, 14th president of The Church of Jesus Christ of Latter-day Saints. Other notable recipients include Sam Berns, an American teen who had progeria and helped raise awareness about the disease, and Ross Ulbricht, the creator of the darknet Silk Road (marketplace). The National Eagle Scout Association researched the total volunteer hours of the Eagle service projects ever done and it came a total of more than 100 million hours of service. Each year, new Eagle Scouts add more than three million more hours. Eagle Scouts completed about 9.5 million hours in 2011. August 1, 2012, was designated by the BSA as National Eagle Scout Day in recognition of Eldred's accomplishment in 1912. ^ Wendell, Bryan (February 21, 2018). "Eagle Scout Class of 2018: A Comprehensive Look at the Numbers Behind the Number". Bryan on Scouting. Scouting. ^ Malone, Michael S. (2012). Four percent : the story of uncommon youth in a century of American life. ISBN 9780985909710. ^ a b "Eagle Scout Class of 2016, by the numbers". Scouting Magazine. February 8, 2017. Retrieved March 16, 2019. ^ "Editions: Boy Scout Handbook by Boy Scouts of America". LibraryThing. Retrieved August 14, 2015. ^ BSA Editorial Board (1911). The Official Handbook for Boys. Garden City, NY: Doubleday, Page and Company. ^ "The first Eagle Scout". Filpac. Retrieved August 14, 2015. ^ Ray, Mark (Winter 2005). "Eagle Scout Heritage Celebration Brings History to Life". Eagletter. 31 (3): 8–9. 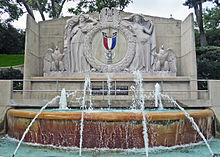 ^ "Eagle Scout Memorial Fountain". KC Fountains. Retrieved January 10, 2014. ^ Reagan, Ronald (September 14, 1982). "Remarks by Telephone to Eagle Scout Award Recipient Alexander M. Holsinger". The American Presidency Project. Retrieved October 17, 2006. ^ Spiros, Dean (June 17, 2009). "Lakeville teen is Eagle Scout No. 2 million". Star-Tribune. Archived from the original on May 18, 2013. Retrieved May 16, 2015. ^ "The BSA Expands Programs to Welcome Girls from Cub Scouts to Highest Rank of Eagle Scout" (Press release). Boy Scouts of America. October 11, 2017. Archived from the original on October 11, 2017. Retrieved October 11, 2017. ^ Williams, Pete (October 11, 2017). "Boy Scouts Will Admit Girls, Allow Them to Earn Eagle Scout Rank". NBC News. ^ a b "Eagle Rank Requirements". US Scouting Service Project. January 1, 2019. Retrieved March 18, 2019. ^ "Eagle Scout Alternative Rank Requirements". Boy Scouts of America. Boy Scouts of America. Retrieved June 7, 2015. The physical or mental disability must be of a permanent rather than of a temporary nature (or a disability expected to last more than two years or beyond the 18th birthday). ^ "Details on temporary Eagle exception for new Scouts BSA members". Retrieved March 21, 2019. ^ Implementation Details for First-time Members Entering Scouts BSA. Boy Scouts of America. ^ a b "Guide to Advancement" (PDF). Boy Scouts of America. #33088. ^ "Line of Duty Fallen Eagle Recognition". Boy Scouts of America. ^ "Eagle Rank Requirements". Boy Scouts of America. Retrieved June 7, 2015. ^ "Camping". MeritBadgeDotOrg. February 10, 2014. Retrieved August 14, 2015. ^ "Camp Minsi 2015 Merit Badge Opportunities". Camp Minsi. 2015. Retrieved August 14, 2015. ^ Wendell, Bryan (October 17, 2012). "Cooking, Sustainability merit badges to become Eagle-required". Bryan on Scouting. Scouting. ^ "Eagle Scout Requirements: A Comparison of the BSA's Eagle Requirements since 1911". Troop 97. 2003. Retrieved March 20, 2006. ^ a b c Peterson, Robert (2002). "Evolution of the Eagle Scout Award". Scouting. Boy Scouts of America. Archived from the original on January 1, 2004. Retrieved April 16, 2010. ^ Wendell, Bryan (December 31, 2013). "Here are the three big changes in the BSA that happened on Jan. 1, 2014". Bryan on Scouting. Scouting. ^ Wendell, Bryan (May 1, 2014). "Now there's a new, third way to wear Eagle Scout palms". Bryan on Scouting. Scouting. ^ "Eagle Scout Palm Application" (PDF). Boy Scouts of America. Archived from the original (PDF) on September 10, 2014. Retrieved September 24, 2014. ^ "Use of Silver and Gold Officer Insignia of Rank". The Institute of Heraldry. United States Army. Archived from the original on May 4, 2006. ^ "Silver Outranks Gold". Retrieved November 11, 2011. ^ "Boy Scout/Varsity Scout Uniform Inspection Sheet, Item #34283" (PDF). Boy Scouts of America. 2000. Retrieved March 6, 2006. ^ a b Insignia Guide 2005. Boy Scouts of America. 2005. #33066E. ^ "ScoutStuff.org". Boy Scouts of America. Retrieved March 4, 2006. ^ a b c d e f Grove, Terry (2004). A Comprehensive Guide to the Eagle Scout Award (Twentieth Century ed.). pp. 10–170. ISBN 978-0-9776534-8-5. ^ a b "Awards, Badges, and Insignia". Boy Scout Stuff – Virtual Boy Scout Museum. Archived from the original on April 26, 2012. Retrieved December 14, 2011. ^ "Eagle Scout News". Eagletter. 32 (2): 2. Fall 2006. ^ a b [unreliable source?] Murray, Craig. "The Eagle Badge". Boy Scout Badge History. Retrieved June 19, 2006. ^ Wendell, Bryan. "Centennial Eagle Scout Badge". Bryan on Scouting. Scouting. Retrieved February 3, 2012. ^ [unreliable source?] Murray, Craig. "Eagle Scout Miniature Badge Pin". Boy Scout Badge History. Retrieved May 24, 2006. ^ Crowl, George. "Illustrated History of BSA Square Knot Evolution" (PDF). Retrieved March 24, 2006. ^ Murray, Craig. "Eagle Square Knot". Boy Scout Badge History. Retrieved May 24, 2006. ^ a b c d "Distinguished Eagle Scouts" (PDF). Boy Scouts of America. Retrieved November 4, 2010. ^ "Scouting's Bottom Line". U.S. Scouting Service Project. 2007. Retrieved November 1, 2007. ^ a b c d e f Townley, Alvin (2007). Legacy of Honor: The Values and Influence of America's Eagle Scouts. New York: St. Martin's Press. ISBN 978-0-312-36653-7. ^ Jang, Sung Joon; Johnson, Byron R.; Kim, Young-II (April 10, 2012). Eagle Scouts: Merit Beyond the Badge (PDF) (Report). Institute for Studies of Religion, Baylor University. Retrieved March 5, 2015. ^ "Scholarships". National Eagle Scout Association. 2015. Retrieved August 16, 2015. ^ AFRS Instruction 36-2001, Recruiting Procedures for the Air Force (PDF). U.S. Air Force. 2005. Archived from the original (PDF) on February 28, 2008. Retrieved March 6, 2006. ^ Military Personnel Procurement Manual, Volume 2, Enlisted Procurement (PDF). U.S. Marine Corps. 2004. Retrieved March 14, 2013. ^ Active and Reserve Components Enlistment Program (PDF). United States Army. February 8, 2011. p. 16. Army Regulation 601–210. Archived from the original (PDF) on August 11, 2009. Retrieved May 31, 2011. ^ "USNA Prep's FAQ". Archived from the original on March 6, 2016. Retrieved January 2, 2015. ^ "Character Preparation". Air Force Academy. ^ Wendell, Bryan (July 3, 2014). "413 Eagle Scouts graduated from military academies in 2014". Bryan on Scouting. Scouting. ^ "NESA Scholarships". National Eagle Scout Association. Retrieved May 24, 2006. ^ "American Legion Eagle Scout of the Year". American Legion. Archived from the original on May 6, 2008. Retrieved March 25, 2017. ^ "National Jewish Committee on Scouting". January 9, 2010. Retrieved February 7, 2010. ^ "Arthur M. & Berdena King Eagle Scout Scholarship". Sons of the American Revolution. Retrieved May 24, 2006. ^ "Finding Scholarships for Current and Former Boy Scouts and Girl Scouts". CollegeScholarships.org. 1999. Retrieved August 27, 2015. ^ Florio, Gwen (2000). "Gay Boy Scouts Returning Prized Eagle Badges in Protest". Philadelphia Inquirer. Archived from the original on February 14, 2007. Retrieved February 11, 2007. ^ "In Support of Values". Scouting (March–April 2001). Retrieved August 7, 2007. ^ Traywick, Catherine (July 25, 2012). "Eagle Scouts Return Badges in Protest of Gay Ban". Time. ^ Leitsinger, Miranda (May 24, 2013). "Boy Scouts Vote to Lift Ban on Gay Youth". NBC News. ^ "Boy Scouts of America Statement". Boy Scouts of America. May 23, 2013. ^ Leopold, Todd. "Boy Scouts change policy on gay leaders". CNN. ^ Schmidt, Justin (June 23, 2013). "Former Eagle Scout returns medal to protest gay decision". KCTV. ^ Garrison, Greg (May 28, 2013). "Trussville lawyer says he's returning Eagle Scout badge to protest Boy Scout vote to accept openly gay scouts". All Alabama. ^ "Eagle Scout Information: Famous Scouts". U.S. Scouting Service Project. Retrieved June 7, 2015. ^ "Pinnacle". Time. February 9, 1948. ^ Casto, James E. "Undaunted Courage [part 1]". Retrieved June 6, 2013. ^ "COL Walter "Joe" Marm, Jr". Army Heritage Center. ^ Wendell, Bryan (October 24, 2011). "Vietnam War Hero Receives Distinguished Eagle Scout Award". Scouting. ^ "Congressional Medal of Honor Recipient CPT Arlo L. Olson" (PDF). South Dakota Department of Military and Veteran Affairs. Archived from the original (PDF) on March 8, 2011. Retrieved May 16, 2015. ^ Biederman, Patricia Ward (May 5, 2012). "A Heroic World War II Dentist Finally Gets His Due". Los Angeles Times. Retrieved May 5, 2012. ^ "Rendezvous with the Rattlesnake". The Airman Magazine. 1974. Archived from the original on August 3, 2009. ^ "Jay Zeamer, Jr". Arlington National Cemetery. Retrieved April 16, 2007. ^ "Astronauts and the BSA" (PDF). Boy Scouts of America. Retrieved May 5, 2012. ^ "L. Ron Hubbard – 1911–1923". L. Ron Hubbard: Shaping the 21st Century with Solutions for a Better World. Archived from the original on June 24, 2004. ^ Miller, Russell (1987). Bare-faced Messiah: The True Story of L. Ron Hubbard. London: Michael Joseph. p. 24. ISBN 978-0-7181-2764-0. ^ Ray, Mark (March–April 2007). "Eagle Scouts Welcome Gerald Ford Home". Scouting. Irving, TX. ^ "Speakers Highlight Scouting's Core Values". Scouting. 94 (4): 35. September 2006. ^ Ray, Mark (2007). "What It Means to Be an Eagle Scout". Scouting. Boy Scouts of America. Retrieved January 5, 2007. ^ Wilson, E. O. (2002). "E. O. Wilson on Boy Scouts, Blade Runner, and Huck Finn". Science & Spirit. Archived from the original on September 28, 2007. Retrieved November 8, 2006. ^ Schwartz, John; Itzkoff, Dave. "Michael Moore". The New York Times. Retrieved November 10, 2006. ^ "The First Eagle Scout, Arthur R. Eldred August 21, 1912". Library of Congress. Retrieved May 18, 2011. ^ "Transcript of March 7, 2006, Online Chat with Mike Rowe". Discovery Channel. March 7, 2006. Archived from the original on February 28, 2007. Retrieved March 22, 2007. ^ Gregg, John (May 29, 2012). "2012 MLB Draft Q & A: Jon Moscot". scout.com. ^ "Eagle Scout Manti Te'o sees awards pile up". Scouting. Retrieved March 17, 2015. ^ "Howard W. Hunter" (PDF). Church Educational System. Archived from the original (PDF) on September 29, 2011. Retrieved May 18, 2011. ^ a b Malone, Michael (August 1, 2012). "A Century of Eagle Scouts". Wall Street Journal. p. A13. ^ "Eagle Scouts". Boy Scouts of America. Retrieved May 16, 2015. Ray, Mark A. (1999). The Eagle Court of Honor Book. Ray Publishing. ISBN 978-0-9651207-1-5. Reed, Jeremy C.; Reed, Heather R. (2011). "Chapter 13: Earning the Eagle". Beginning Boy Scouts: An unofficial practical guide to Boy Scouting for parents and new leaders. Reed Media Services. ISBN 978-1-937516-01-7. Wikimedia Commons has media related to Eagle Scouts. "Eagle Scout Badge Images and History". Retrieved January 31, 2008. "Eagle Scouts". U.S. Scouting Service Project. Retrieved June 8, 2006. "History of Required Badges for Eagle Scouts". U.S. Scouting Service Project. Archived from the original on May 19, 2006. Retrieved June 8, 2006. "National Eagle Scout Association". Boy Scouts of America. Retrieved June 8, 2006. "Eagle Scout requirements & resources". MeritBadge.Org. Retrieved February 12, 2009. "Eagle Palm requirements, application, & resources". MeritBadge.Org. Retrieved February 12, 2009.